There are about 1.57 billion Muslims in the world, according to the report, “Mapping the Global Muslim Population,” by the Pew Forum on Religion & Public Life. That represents about 23 percent of the total global population of 6.8 billion. “Overall, the number is higher than I expected,” he said, noting that earlier estimates of the global Muslim population have ranged from 1 billion to 1.8 billion. “Increasingly, the people of the Middle East are making up a smaller and smaller percentage of the worldwide Muslim community,” he told CNN by phone. “When it comes to issues of outreach to the Muslim world, these numbers will indicate that outreach cannot be focused so narrowly on the Middle East,” he said. “If the goal is to create better understanding between the United States and the Muslim world, our focus should be on south and southeast Asia, not the Middle East,” he said. He spoke to CNN before the report was published and without having seen its contents, but was familiar with the general trends the report identified. The team at the Pew Forum spent nearly three years analyzing “the best available data” from 232 countries and territories, Grim said. Their aim was to get the most comprehensive snapshot ever assembled of the world’s Muslim population at a given moment in time. So they took the data they gathered from national censuses and surveys, and projected it forward based on what they knew about population growth in each country. It’s full of details that even the researchers found surprising. “There are these countries that we don’t think of as Muslim at all, and yet they have very sizable numbers of Muslims,” said Alan Cooperman, the associate director of research for the Pew Forum, naming India, Russia and China. One in five of the world’s Muslims lives in a country where Muslims are a minority. And while most people think of the Muslim population of Europe is being composed of immigrants, that’s only true in western Europe, Cooperman said. The researchers also were surprised to find the Muslim population of sub-Saharan Africa to be as low as they concluded, Cooperman said. 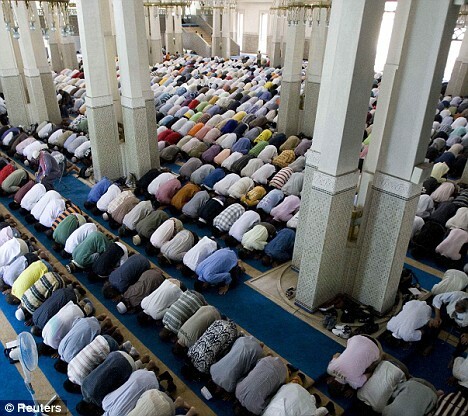 It has only about 240 million Muslims — about 15 percent of all the world’s Muslims. Islam is thought to be growing fast in the region, with countries such as Nigeria, which has large populations of both Christians and Muslims, seeing violence between the two groups. The Pew researchers concluded that Nigeria is just over half Muslim, making it the sixth most populous Muslim country in the world. Roughly nine out of 10 Muslims worldwide are Sunni, and about one in 10 is Shiite, they estimated. They warned they were less confident of those numbers than of the general population figures because sectarian data is harder to come by. “Only one or two censuses in the world … have ever asked the sectarian question,” said Grim. “Among Muslims it’s a very sensitive question. If asked, large numbers will say I am just a Muslim — not that they don’t know, but it is a sensitive question in many places,” he said. “We don’t care only about Muslims,” Grim said. They’re also digging into what people believe and practice, since the current analysis doesn’t analyze that. It is not quantity but quality counts a lot .The day this fact will be realised by them they will stop their population growth mission which is religiously mandatory to them . The demography of Indian subcontinant has changed . Previously the area was dominated by Hindu and Buddhist population and now nearly half of the population is muslim .They have nothing to do with environmental imbalance or biodiversity loss .Most of the terrorists are the by product of such muslim mentality .